Since this product came out a while ago, I have been intrigued to try it as as far as I know, it is the only thing on the market doing this job. I am a big fan of the Soap and Glory 'Easy Glistening' Dry Oil but mainly for the shimmer. However, often body butter can be too time consuming and as it takes so long to absorb it cannot be applied before clothing. Plus at under £2.50, the Vaseline spray seemed a win-win choice for a quick fix. 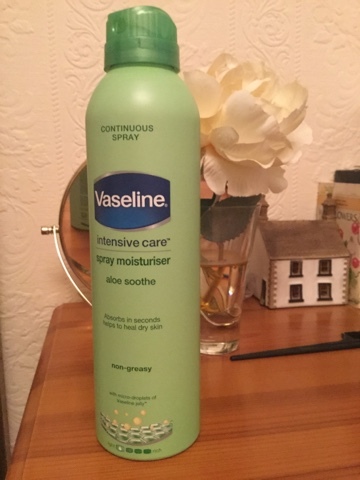 I am really impressed with this product, my skin feels moisturised but not sticky and I could've put my clothes on within 30 seconds of spraying on. The aloe vera is also lovely as it is very subtle and the soothing effect is lovely-today has been quite hot and this was really refreshing. Although I wouldn't trade in my body butter as it is only a light moisturiser, I can definitely see this becoming a frequent item on my shopping list; the size will also be great for travelling!